It's good and important to keep your computer software up-to-date. This includes Java software. If you want to know the ins and outs of Java, click here. Good luck understanding that lot. Suffice to say it pays to have the latest version on our home computer. It goes some way to enhancing your overall security, having the latest version that is. The thing that hacks me off is when the updates come through, there is always the up-selling invite; to select Ask as your search service, and to install their toolbar. 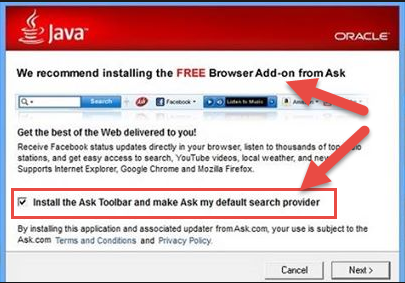 If you want to avoid the toolbar, and I advise you to, just uncheck the check-box on the way to installation. By not installing the Ask toolbar, we can continue to use and enjoy the strength of Google Search.